Sunday, March 24, 8 PM, Ganz Hall, Roosevelt University, 430 S. Michigan; free, but reservations required. While the increasingly discordant standoff between striking musicians of the Chicago Symphony Orchestra and their management continues to silence Orchestra Hall, the musicians are picking up their instruments for a series of free concerts at other venues. The first two—a chamber concert scheduled for Friday, March 22 at PianoForte Studios, and a full orchestra concert of work by Beethoven and Mozart at 7:30 PM, Monday, March 25 at CTU Hall—"sold out" promptly, with reservations at capacity. At week's end, however, names were still being accepted on a wait-list for Monday’s concert. On Friday, in response to public demand, a third concert was added: a chamber group of CSO musicians will perform work by Beethoven, Schubert, and Mozart at 8 PM, Sunday, March 24, in Roosevelt University’s Ganz Hall, 430 S. Michigan Ave. The chamber group will include William Welter (oboe), John Yeh (clarinet), Dennis Michael (bassoon), David Griffin (horn), Mio Nakamura (piano), as well as the Lincoln Quartet, featuring Lei Hou (violin), Qing Hou (violin), Lawrence Newman (viola), and Kenneth Olsen (cello). To obtain the free tickets, visit https://tinyurl.com/CSOganzhall. The discord, so far, includes warring bar charts (purporting to show how well CSO musicians are doing in comparison to musicians in six other major orchestras); claims by both sides that if the other has its way the CSO, as we know it, will cease to exist; and, on Thursday, a verbal attack on philanthropist and Chicago Symphony Orchestra Association board treasurer James Mabie by Chicago Teachers Union president Jesse Sharkey over the main issue in the strike: pensions. CTU, as every Chicagoan knows, does not bother with pianissimo. And Sharkey, as it happens, already had an ax to grind with Mabie, who’s also the founding board chair of ChiArts—a CPS contract school. CTU says ChiArts refuses to pay into the Chicago Teachers Pension Fund. According to a statement released by CTU, "Investment executives like Mabie [a former partner at William Blair & Company] make their money not just by playing in the stock market, an enormously risky bet for workers' retirements, but by charging fees for the privilege of gambling workers’ dollars in the markets—which can significantly erode workers' retirement nest eggs." The CTU statement continues: "[I]t can be argued that management's assault on the CSO musicians' pensions by Mabie and his fellow board members represents the worst kind of self-dealing." Reached by phone on Friday, Mabie said, "The financial structures of the two organizations are completely different. The Chicago Symphony Orchestra is 100 years old and has always had a pension; the high school is 10 years old and has a social security arrangement." And, he added, "I'm not part of the negotiating team at either CSO or ChiArts, but to say that I am opposed to pensions is categorically false." Symphony Center is silent as the orchestra hits the street. 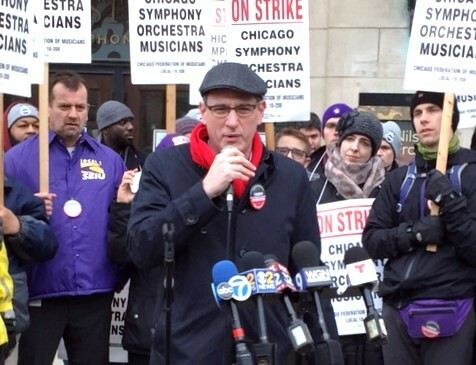 The Lyric Opera orchestra is on strike; performances in question. The innovative multimedia shows were meant to bring new audiences to the symphony.